I had to get the Glamour Doll Eyes Liars Keep Secrets Collection, because it's inspired by the tv show Pretty Little Liars. It's one of my guilty pleasure shows, so bad that it's good. 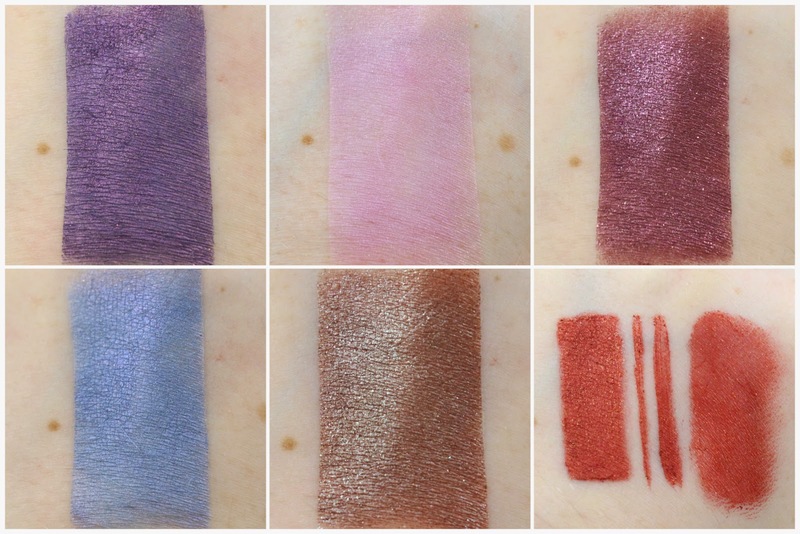 The collection is in collaboration with Kiss My Sass Cosmetics, which I hope to get their part of the collection, but this review will just be for the portion from Glamour Doll Eyes. The collection consists of 4 eyeshadows, 1 blush, and 1 eyeliner. 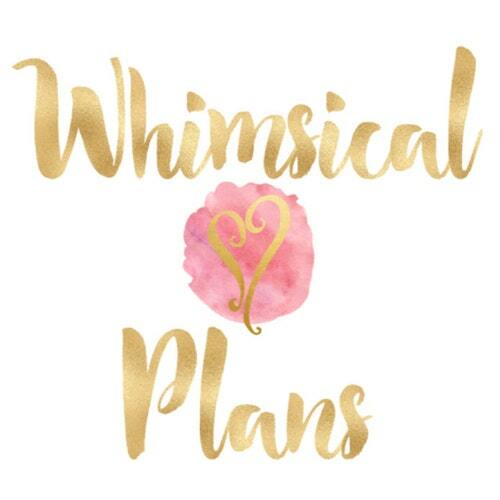 About - Glamour Doll Eyes is an indie cosmetics company specializing in eyeshadow, blush, lip glazes, gel eyeliner, and will be soon venturing into pressed shadows. 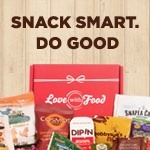 Vanessa, the owner, is based in Nevada, and has been doing a monthly subscription for three years. Shipping - My order shipped the next day, and arrived 5 days later via USPS from Nevada to California. No idea what took it so long to arrive, but this was during the holidays. 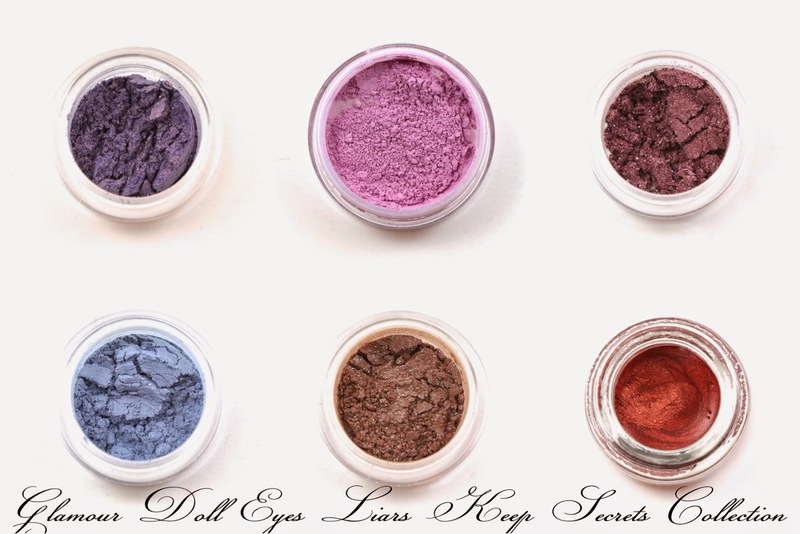 Product Size - The eyeshadows are all available as samples, sample jars, or full size jars. The blush is in a sample jar or full size jar. And the eyeliner is only available as full size. Free Samples - You almost always receive the monthly gift with purchase shade with every order, and usually also 2 samples. 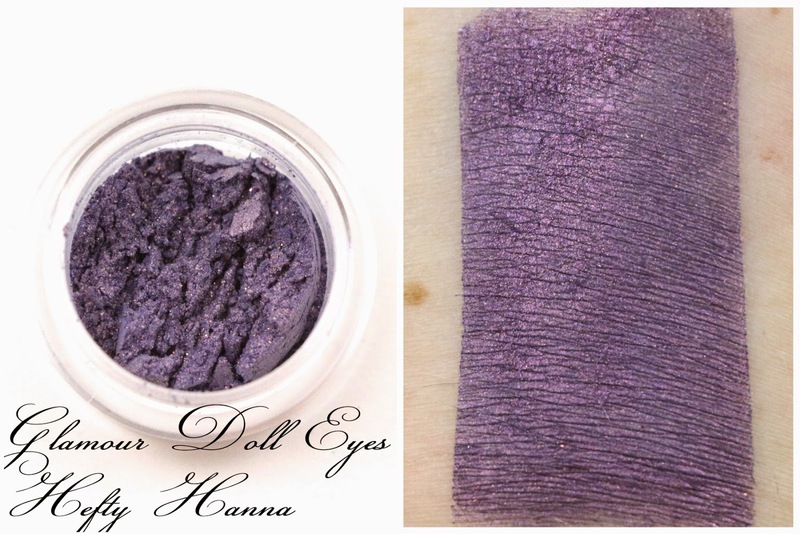 Hefty Hanna - "A blackened purple with a strong pink sheen and a very subtle copper sparkle." I am very glad this isn't made with a black base, it's so much prettier than that. I love the pink sheen and the copper sparkles. I think this shade would look great with Madhouse Mona or Not Your Secret. 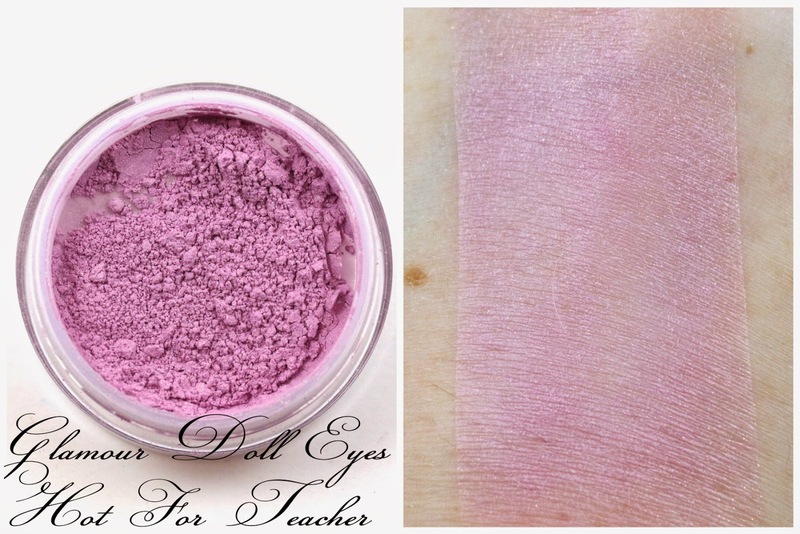 Hot For Teacher - "A light pink matte base with a subtle golden sparkle." I received a sample of this blush in the OTM one month last year, and I loved it so much I had to buy a full size. It does have a little sparkle in it, but it's mostly matte. 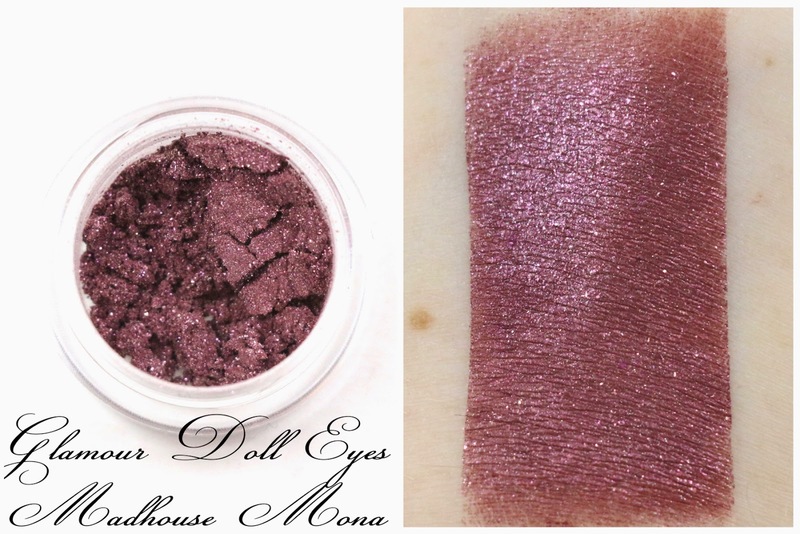 Madhouse Mona - "A burgundy base with a subtle red shift and a golden red sparkle." This is definitely my favorite color in this collection, at least out of the eyeshadows. I love the red sheen and all the pink sparkles. 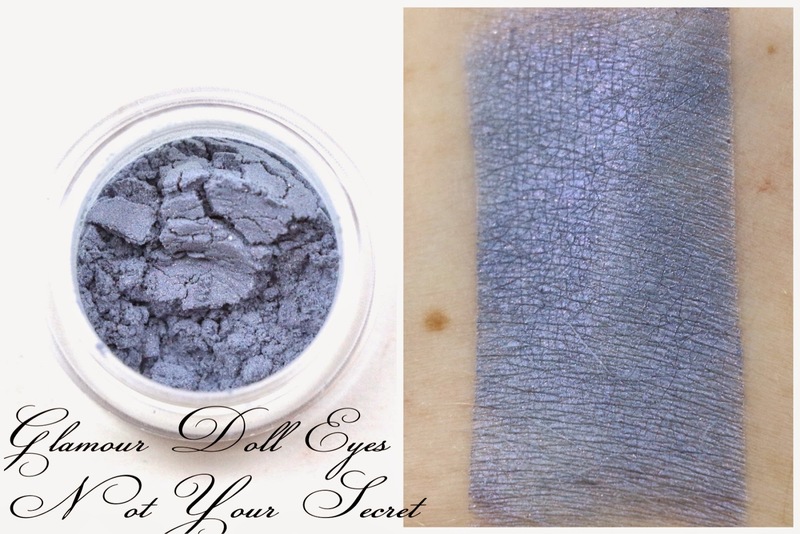 Not Your Secret - "A medium grey blue with a purple duochrome and a slight pink shimmer." The base of this shadow was almost matte, and the sheen looked like a purple red shade. I couldn't see much sparkle though. Radley Prep - "A medium brown base with a golden beige overlay and a gold - green - blue sparkle." This medium brown had a strong green shift with lots of green sparkle. Red Coat - "A vibrant red with a golden shimmer." 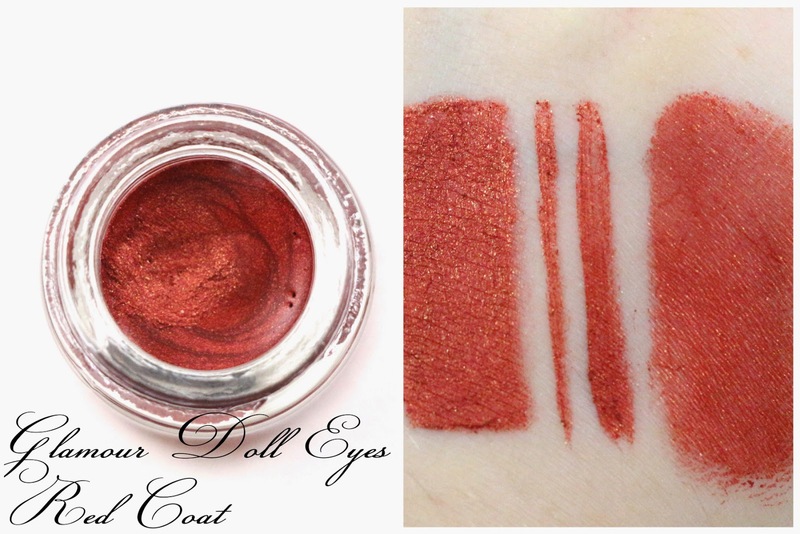 This product is a red gel eyeliner with lots of golden shimmer. 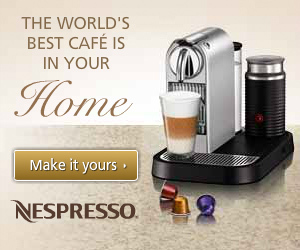 It's very creamy, but once it sets, it's really stuck on. My swatches were a thick line with a brush, 2 lines with a liner brush, and then blended out with my finger. The product itself is very creamy, and this particular shade is lip safe, I'd be curious to see how it would work as a cream shadow or a lip product. Overall, I like this collection. My favorites were probably Hot For Teacher, Madhouse Mona, and Red Coat. I think the colors themselves and products would work well together to make a lot of various looks, but I didn't find the shadows to be very original. I did enjoy reading why each color was chosen for each of the characters, and I think they all fit really well to the show. I think if you're a fan of the show Pretty Little Liars, this collection from Glamour Doll Eyes is a must have, and even if you're not a few of the products and shades are worth checking out. Availability - This collection is permanent. 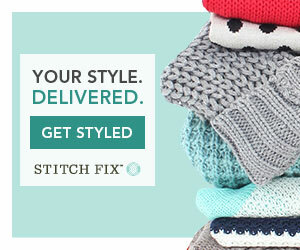 Some products may be out of stock, but they will return as soon as new stock is made. Overall Satisfaction - My favorites were Hot For Teacher, Madhouse Mona, and Red Coat. I am glad I got a chance to get Red Coat, because it's been out of stock for quite a while. 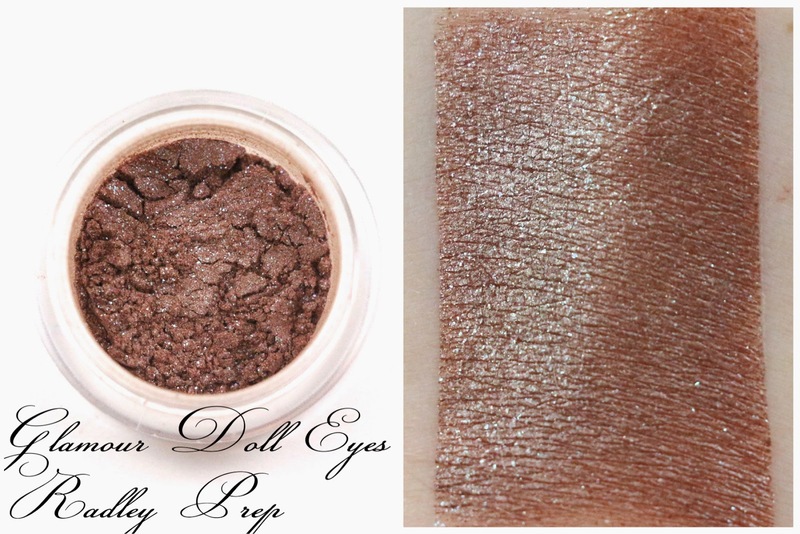 What did you think of the Glamour Doll Eyes Liars Keep Secrets Collection? Let me know in the comments!